SoftPlanet makes it possible for everyone to get free Insta-LockDown download directly from our servers. There is no registration needed for downloading. Insta-LockDown 2.2 is simple, yet powerful software, which add an additional security layer to your PC protection against unauthorized access attempts by locking your computer via a single key combo. This utility will block any attempt for transferring your personal date to any kind of external drives, email providers, social networks, etc. 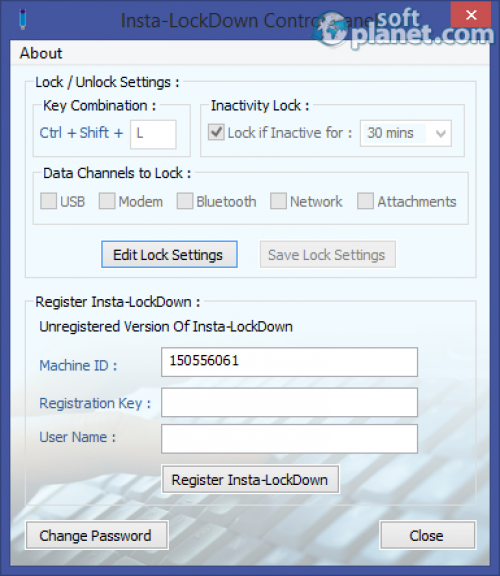 Basically, Insta-LockDown 2.2 is designed to prevent the most commonly used methods of transferring data from your PC. The app is very appropriate in case that your computer is used by several different people. Insta-LockDown will block any attempt of copying your data to removable drives, Facebook, Twitter, YouTube, Gmail, Hotmail, Yahoo, etc. In addition, this handy program supports almost any kind of connection available nowadays. Thus you can be sure that your data will stay where it suppose to be. It can data transfers via WiFi, wired connections and Bluetooth. Insta-LockDown is superb software, which can add an extra layer to your PC security. Actually it is completely necessary utility in case various people have access to your system. Please do not hesitate to try it right away and post your observations within the Comment field down below. Our security scan shows that Insta-LockDown is clean from viruses. The current version of Insta-LockDown has been scanned by our system, which contains 46 different anti-virus algorithms. That ensures that Insta-LockDown 2.2 is 100% safe for your computer.